1.1 How to treat psoriasis? 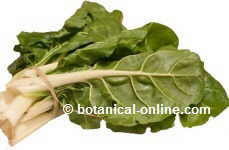 How to get rid of psoriasis naturally? How to treat psoriasis? How to get rid of psoriasis naturally? 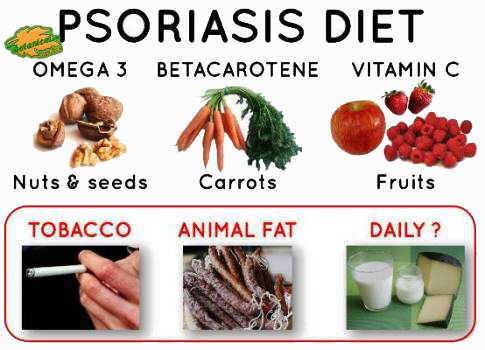 Proper nutrition seems to be crucial in the prevention and treatment of psoriasis. Nutritionists’ opinion is that the ingestion of food containing toxins or the oxidation of the body itself are responsible for an organic imbalance that is manifested, in addition to some general body health problems, through unhealthy skin. The use of a natural diet, very rich in foods with antioxidant properties, is capable of neutralizing these toxins. Moreover, the moderate use of certain foods prevents the occurrence of an intestinal imbalance that will worsen or trigger the onset of this disease. Omega 3 fatty acids sources. 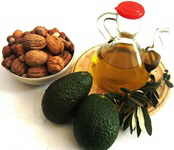 – Omega-3 Fatty Acids: These acids exert a positive action in the maintenance of a healthy skin, so they are appropriate to prevent or improve diseases affecting this organ, such as eczema or psoriasis. Its effects are due to its anti-inflammatory properties and the fact that many foods with omega-3 are rich in vitamin D. People with psoriasis have difficulties to produce this vitamin, so that, the intake of these foods could benefit them. – Blue fish and fish oil (sardines, herring, salmon, tuna, etc.) contains a lot of omega-3 fatty acids (types EPA and DHA) and vitamin D.
– Vegetable oils (non refined): Flax seed oil has the highest proportion (533 mg per 100 g) followed by canola oil (111mg) or nut (104 mg) Other vegetable oils that can be included here are soybean, wheat germ oil or hazelnut oil. – Nuts and seeds:Pecans, walnuts, sunflower seeds, flaxseeds, chia, almonds,etc. Pumpkin soup. Orange foods are high in betacarotene. – Vitamin A: It is well known the importance of vitamin A in skin care. A diet rich in foods containing vitamin A helps prevent and improve the condition of patients with psoriasis. 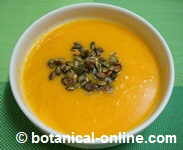 Certain foods and especially vegetables containing carotenoids that the body converts into vitamin are recommended. High-vitamin A foods will include those plant foods that are orange, red or yellow vegetables, especially spinach, carrots, pumpkin, watercress, borage, basil, squash, tomatoes, coriander, asparagus, dandelion peppers, etc. Non-vegetarian people can make use of high-vitamin A animal foods such as liver, egg yolk, fish (especially blue fish) and butter. Chards are rich in folic acid. –Folic acid (vitamin B9): Folic acid is a is very good for the health of skin cells. Foods contain this acid in the form of folate. High-folate foods are legumes, whole grains, green leafy vegetables, and certain fruits. Among the richer ones we have chickpeas, lentils, dried beans, tender beans, spinach, asparagus, avocados, oranges, wheat germ or bread. – Selenium: This mineral is very important in skin health. It maintains the elasticity of the skin and prevents the negative effects that time and oxidation produce on it. Foods rich in selenium are squash, barley, grapes, garlic, oats, peaches, corn, soybean, pistachios, Brazil nuts, asparagus or spinach. – Zinc: Another mineral that helps keep skin healthy. In addition, it has been shown that people with psoriasis have more difficulties to retain this component. One should have to take into account the amount of products aimed to eliminate dandruff containing this mineral . A diet rich in zinc can help prevent or improve psoriasis. Foods rich in zinc are celery, asparagus, borage, figs, potatoes, peanuts, eggplant, cashews, sunflower, and grains… For non-vegetarians, seafood contains a very high amount of zinc. – Meat, milk and fats and psoriasis: A higher intake of these foods is harmful for the person with psoriasis because these foods worsen this disease. The reason for all this has been attributed to the fact they possess arachidonic acid. This could not be completely true, considering that Brussels sprouts are rich in this acid, along with the rest of cabbage family foods, which are particularly suitable for the diet of psoriasis. It is generally established that a low-fat diet, together with a moderate protein intake can be very helpful.Animal entrails should be avoided. – Alcohol and psoriasis: Alcoholic beverages are considered to trigger psoriasis. They do not only worse its symptoms because of alcohol vasodilating properties, but they also increase blood flow to the skin affected by psoriasis which produces more itching and redness. – Spices: Equally, they raise peripheral circulation, so they are not suitable. – Tobacco and psoriasis: Being a toxic, tobacco must be eliminated from the diet of people with psoriasis. More information about psoriasis and its natural treatment.